History : It is believed that Amaryllis was found before the sixteenth century. However, Europe had the privilege of catching the sight of this plant only at the beginning of the sixteenth century. The amaryllis bulbs are thought the be brought and introduced to the the European countries by the Portuguese. However, the United Kingdom could only catch a glimpse of this plant two hundred years after the Europe did. The flower amaryllis was introduced to Europe at the beginning of the eighteenth century. The name of the flower that we call Amaryllis today has gone through quite a change. It was called Amaryllis for some four decades. After that, it was called Hippeastrum for another four decades. Later, it was named Amaryllis pardina. The flower, A .pardina, was so famous among the florists for the lack of a funnel and the long width of the petals. It is known that the kings of Belgium loved and admired the flower so much that it was named after the place where the king of Belgium first saw the flower. Amaryllis has all the great qualities of a beautiful flower and today many varieties of cultivars can be found. Myth : Once upon a time, in the land of Greece, there lived a girl named Amaryllis. She was young and beautiful. She was passionately in love with a tall and handsome boy named Alteo. Conflict began when he showed no apparent interest in the girl. She would try to talk to him, convince him of her love for him. He was skeptical of love. He never believed her. Amaryllis was deeply hurt and heart broken as he could not see the true love she had for him. She could not give up on him as she loved him so much. Thus, she went to Oracle at Delphi for some solution. He told her that there was only one way to win Alteo’s heart. She had to show him that she loved him, wanted him, more than she loved herself. Oracle told her that she could win his heart by piercing her heart by a beautiful arrow and letting the blood spill. She was told that she had to perform this ritual everyday at midnight in front of alteo’s door. The blood had to spill before Alteo’s door. She had to repeat this act everyday until he accepted her and told her that he had faith in her love. Amaryllis was madly in love with the boy and was willing to do everything to win his love. Thus she followed Oracle’s suggestion. Everyday, she went to the place where Alteo lived and she pierced herself, somewhere near the heart to tell him the depth of love that she had for him. Alteo had a cold heart, the blood that spilt from the girl’s body didn’t bother him. She could not melt Alteo’s heart. Thus she followed the act everyday, for thirty days. On the thirtieth day, she died. On the spot where her bood was spilt, a flower rose. The flower is a symbol of passion and true love. Alteo picked the flower and regretted not being able to see the love that Amaryllis had for him. The name of the beautiful, red flower was thus named after the girl that bled to death for love, Amaryllis. Variety : A large variety of Amaryllis can be found. They vary in terms of tallness, size of flowers, color of the flowers and the number of blooms. They can be found in hues of white, red, pink, yellow and orange. 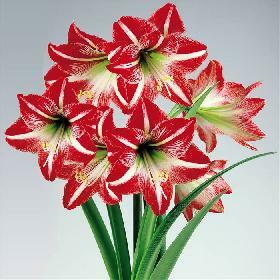 Desert dawn is the most famous variety of Amaryllis flowers that gives a beautiful red color. Some flowers contain more than one hue. These flowers come in mixtures of hues. A flower variety known as Sydney comes in a blend of white and deep red. Some flowering varieties are known to have “double flowers”. There appears to be two ring of flowers in a single flower. The flowers contains one small flower inside and a big flower on the outside. The other variety are those flowers which are short in height but produce more flowers than the tall ones. The flower called Green goddess is relative the best example of these short animals. Planting Outdoor : One should always buy the big bulbs. The bigger, the better. The point is that big bulbs produce far more flowers than the small ones. Once the bulbs are bought they should be kept in the fridge or a cool area of an approximate temperature of 45 degree Fahrenheit. One should not keep the bulbs in the de-freezing area of the fridge though. That could badly damage the bulbs. The best time to plant the bulbs is from October to the beginning of July. The flower flowers for an average of eight weeks. The flowering phase usually starts from the right beginning of January till the start of July. The plant thrives best in soil where water is easily drained. The plant can be grown best in areas where there is a little bit of shade. The bulbs should be planted with an approximate distance of 13 inches between each other. The soil should be dug with spade and the bulb should be placed in such a way that the pointed part of the bulb faces upwards, towards the person who is doing the planting job. Once they are planted the amaryllis bulbs should be watered frequently. They must be watered daily. A couple of weeks later one can be able to see the plant sprouting from the soil. They should also be given fertilizers for effective growth of the plant. Planting Indoor : The Amaryllis thrive really well in the indoor areas. They can be found in a wide array of colors and totally upgrade and beautify the place where the flower is grown. The flowers can be planted in one’s room, office or bathrooms. They can be kept in vases or any other containers. One should have the knowledge of the choice of bulb that he buys. If a person buys a bad bulb then all of his work will go in vain. Thus one should pick a large bulb. One should also not bring a home a crinkled bulb. The plant grows best in soil that is well drained. Thus, the container in which the bulb is to be gown should have a wide enough holes for the drainage of water. Also, it is best if one gets a pot that is about three inches broad. The bulb should be planted in such a manner that once the bulb is kept, the distance from the top of the container to the top surface of soil is an inch. The vessel should be contained with soil. It should be watered almost daily. They can be kept in balconies after the plant starts to sprout. Fertilizers should also be added. Uses : Throughout the history, Amaryllis has been used as medicinal plants. Amaryllis is used as a treatment of cancer, a long time ago. They were also used in places or small groups of ethnic people. These plants can be excellent source of beauty in tranquility for one’s home or office. They can be grown both indoor and outdoor. These are one of the few plants that thrive best indoor. They can be found in a wide array of colors which can be matched with the color of one’s room. They can also be planted close to the gate of one’s house. Caution : Too much of everything is bad. There are some cautions that one should take in order to the ensure the effective growth of the plant. Sometimes these plants may not give or rather produce flower at all. These consequences can take place due to many reasons. One of them is the lack of sunlight that the flower may go through. Yes, the plant need a shady area for effective growth but it also needs little bit of sunlight too. Without the sunlight, it can not photosynthesize to produce the flowers. Also, a very high amount of nitrogenous fertilizers or water can in fact cause negative consequence resulting in the lack of growth of flowers. These plants attract insects and minute animals like nematodes. If these animals are seen, they should be removed from the plant by the use of hand. However, if the infestation and effect of these animals is really high, the plant should be sprayed with chemical sprays.